Can anyone tell me what are the listed cables with acceptable ground return paths are. As it is referred to in 517.13. Haven't received my copy of 2002 yet and I have to plan installations for the year year. 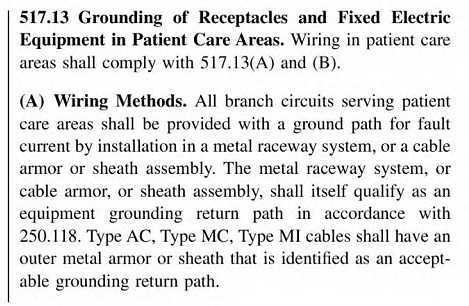 "The metal raceway system, or cable armor, or sheath assembly shall itself qualify as an equipment grounding return path in accordance with 250.118." Although they mention A/C, M/C, & M/I cable, the only one I know of is A/C for your useage. This is nearly a repeat of the Q you already asked in another section of the BB. Be sure to check with the local AHJ as to what edition of the Code they are using before you incorporate any 2002 changes. Many of them in my area are still basing everything on the '96 Code! Just so everyone understands, the combined metallic sheath and the grounding conductor of the interlocking armor type MC cable does not meet the requirement in 517.13. Here is the exact reference from the new 2002 NEC. What part of this is not clear or understood? My point is that MC cable that is listed as an EGC per 250.118(11)(a) is not suitable for 517.13 installations because the sheath istself does not qualify as an EGC. It only qualifies when combined with the internal grounding conductor, and therefore does not meet the requirements of 517.13. Do you know a company that has type MC or MI Cable that meets the requirements? (Come on, now!) What part don't you understand? My concern is that if Mr Gardiner specs a freak, it will be a long lead-time item, and will not be acceptable when his EC gets it. Use AFC's type AC-HCF (as Nick said) or an approved equal, and you can put it to bed. Seems like MC cable is also approved for Fire Alarms.